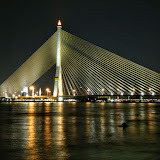 The Rama 8 Bridge is a cable-stayed bridge crossing the Chao Phraya River in Bangkok, Thailand at the upper reaches of Bangkok’s main area frequented by tourists. In fact, the bridge is used as the turning point for the large tourist dining boats as they tour the Chao Praya River for dinner time. The bridge offers a large safe walking area which is great for viewing the passing boats or catching a great Bangkok Sunset. The best views of the bridge are either from the river by boat or the Rama 8 Park on the bridges south western bank or the Santichai Prakan Public Park located down river and on the eastern bank of the Chao Phraya River. The bridge has an asymmetrical design, with a single pylon in an inverted Y shape located on the western bank of the river. The Bridge opened in 2002 and was one of the world's largest asymmetrical cable-stayed bridges at the time of its opening.